It's easy to forget that a century ago, gasoline-powered cars didn't completely dominate the automobile market. In 1900, roughly 40 percent of all cars sold in the U.S. were steam-powered. And in fact, when the Boston police bought one of the country's first cop cars in 1903 it was running on steam. The Boston PD's 1903 cop car was a Stanley Steamer. But even though we might think of steam-powered vehicles as a joke today, these weren't lightweights. They were known as some of the fastest cars around. The police force was quick to buy up more steam-powered cars whenever they could. The Boston Police Department, which has been making use of autos for some time, has decided to add two high-speed [steam-powered] runabouts, to be used on the parkways and boulevards of the city, in the early spring. Some of the police department's steam-powered cars didn't last very long (one Boston PD steam car bought in 1905 lasted just over 7,000 miles before being decommissioned) but the cars could catch any speeders they were after. 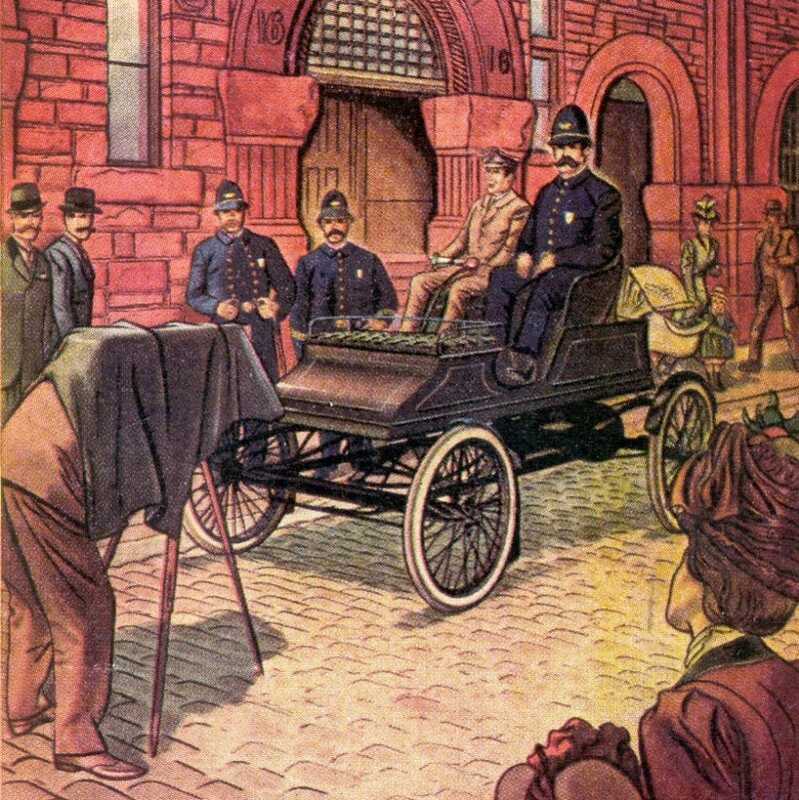 There was the added benefit that the police force was hiring civilian chauffeurs (shown above in a 1903 illustration) who stayed with the vehicles when police officers needed to jump out and pursue a suspect. Automobile No. 2222, a steam runabout, has been in service since June, 1905. It was on duty 137 days, and covered a distance of 7,672 miles in the West Roxbury district. This machine went out of commission and was replaced on May 10, 1909, by a new Ross steamer, No. 14567. Now that the police automobile chasers are to have two new, powerful steam automobiles, obviously the only safety for automobilists who want to run faster than the law allows will be to get on the force. While Boston likes to lay claim to the first police car, Akron, Ohio actually had a police patrol car in 1899, pictured below. But Akron's wagon wasn't steam-powered. It was electric.